Email can be a lucrative source of leads as long as your email funnel is operating at full efficiency. No matter how profitable your email marketing presently is, some special email services can help increase the ROI of your email campaigns. Whether you’re sending emails to highly engaged subscribers or whether you’re trying to re-engage an old list, you can use all the help you can get. If you’re looking for ways on how to improve your email marketing ROI, here are seven types of email services that your business can use to improve email marketing results. Your company’s emails should be interesting enough for your readers to open them. If you’re having trouble writing catchy email subject lines with a strong call to action, multiple services are available to improve your subject lines, which, in turn, can improve your open rates. Services like Coschedule and SubjectLine offer easy to use email subject testing tools. You can check subject line for its clarity, urgency and conciseness before sending your next round of emails. You finally have your emails perfectly crafted and ready to send to your subscribers. But how do you know what it will look like on your customers’ screens? Some will be on netbooks, some on desktops or laptops and others will be on tablets or smartphones. Add to this the varied world of different email clients, and you have a combination of devices and services that might not match up to what you’ve lovingly designed on your office computers. The best way to deal with this problem is to use an email testing tool. These tools allow you to preview how your emails will look like across a wide range of devices. A versatile email testing service can also allow you to make edits without leaving the interface. Some of them can even point out potential problems that might send your email to spam. Email on Acid is one such service you can check out. Sending emails to non-existent addresses can cause plenty of problems for your company, including getting your company placed on all kinds of spam lists. You might think that letting a few emails slip through won’t harm your company’s bottom line. Think again: a hard bounce rate above 2% could land your business in all sorts of spam blacklists. Large bounce rates can cause ISPs to become suspicious about businesses who send so many messages to unreachable email addresses. These undeliverable emails look like spam, and ISPs will take drastic measures to protect their customers. That’s why businesses need an email checker in their toolset. Let’s look at what happens when a business doesn’t have an email checker tool. The worst case scenario is when a company gets their sender reputation drastically reduced. Because ISPs don’t trust companies with low sender reputations, your emails will never reach potential customers. You don’t want something as simple as not having an email checker tool tripping up your email campaigns. An ISP will simply force your emails straight to a user’s spam box if they don’t trust your sender reputation. Your real customers lose out on your messages just because you didn’t cull the dead leads from your email database. Losing access to a particular ISP (like Comcast or Uverse) means you have to optimize campaigns around the ISPs available to you. That’s like a company deliberately avoiding a broad swath of customers just because they can’t be bothered to use an email checker to verify the email addresses on their list. 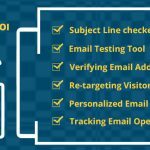 The leading bulk email verifier QuickEmailVerification gives startups and established companies a way to boost their sender scores with ISPs and practically eliminate email bounces. Improving your ROI as a business means reaching as many customers as possible, so don’t let something as silly as sending to dead email addresses ruin your chances to improve email marketing and having it pay off as it should. Do you have a way to change your email subscription links according to how your visitors behave on your site? If not, then HelloBar is a useful service to help implement this strategy. The service leverages the fact that a sticky banner at the top or bottom of your website is an effective email opt-in strategy. It allows you to embed your email sign-up links subtly into these sticky bars without them being intrusive to your visitors. You can setup HelloBar to show opt-ins to visitors according to where they are in the sales cycle. A user just browsing around the site for the first time is probably not as hot of a prospect for your business compared to someone who’s now on their second visit. It allows you to change the targeting of the banners with your email opt-in links. For example, a rule can be created to show the bar to people who have been on your site before or only to those new to the site. This allows you to craft different messages for different visitors according to where they are in your sales funnel. It also allows you to change the text and the colors to improve the bar’s visibility. It also provides stats for each particular opt-in bar that you’ve created. These stats include views and clicks that you can integrate with your conversion rate stats from your email service provider. Personalization is a quick shortcut to getting better response rates to your emails. Not personalizing your email is one of the most common email marketing mistakes. But the ultimate “personalization” is knowing what each of your customers is going to do before they do it. Sailthru.com offers a suite of email tools that allow you to write personalize emails effectively and predict your ROI from email campaigns. Sailthru is particularly popular with E-commerce stores as their suite helps stores increase customer retention and turn browsers into buyers. Its email personalization feature makes it easy to cater to very niche audiences. Dynamic subject lines allow you to feature products that the customer has already browsed on your site. Personalized send times give you a way to reach your customers when they are most likely to open your messages. Newsletters and recommendations can be laser targeted according to your shopper’s interests. Sailthru can accomplish this by creating a dynamic customer profile that changes as users browse and shop at your site. Sailthru uses AI in their prediction manager. The prediction manager gives a wide variety of predictions that are actionable for decision makers. These predictions include total purchase value and number of items, the probability of customer buying in the coming week or month, expected yearly revenue from the customer based and so on. What if every single piece of email your business sent was never even read by the recipients? You may laugh that off, but how do you know it isn’t true? You can start by using services like Yesware or SalesHandy to track your email open rates. You’ll be able to see the open and reply rates to your company’s emails. You can even know what pages are being read in your attachments. This gives a business valuable data on the pages that don’t need to be in the sales presentations attached to the emails. You can also see when your emails were opened. This allows you to pinpoint your campaigns to the time of day that will give you the best open rates. All the data, from emails read to the devices they’ve read them on, can all be imported directly into Salesforce. This adds rich data to your Salesforce records that a company can build targeted email campaigns around. Businesses used to be content with sending out email blasts and hoping for conversions. The variety of email tools available for helping fine-tune your email campaigns allows businesses to squeeze the most out of their email lists. Don’t waste time and money by skipping simple things like verifying your emails and checking open rates. Businesses who use these email tools will be far ahead of those that don’t.